Shawn Heiden's Hillcrest High team fell short in the its 1989 Utah division championship game, but Heiden did his best to get them the win, according to The Deseret News. Heiden pitched a strong game, giving up just two runs, The News wrote. His team lost by a score of 2-1. "It's tough right now," Heiden told The News afterward. "We had a great season - now we just have to think about everything we did." Everything Heiden did got him a contract with the pros, but not a long career. He played two pro seasons. He never made AA. 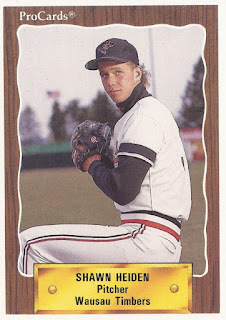 Heiden's career began that year in 1989, taken by the Orioles in the eighth round of the draft out of Hillcrest High in Sandy, Utah. At Hillcrest, Heiden not only helped his baseball team to the title game, he also played basketball. He helped his team to a December 1987 win, stopping a top rival player, according to The News. "I think he was a little frustrated at first," Hillcrest basketball coach Steve Margetts told The News, "and I thought Shawn Heiden, who is a tough, hard-nosed kid, did a great job against him." On the baseball field, Heiden went 10-2. Drafted by the Orioles, he quickly signed. Heiden started with the Orioles at short-season Bluefield. He got into nine games, starting six. He had an 8.73 ERA. He moved to single-A Wausau for 1990, getting into 19 games, starting two. He also got another start at Bluefield. Overall, he went 2-5, with a 5.35 ERA, ending his career.